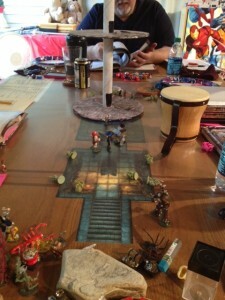 ← We had a guest DM at our game this Sunday, man she is tough! A few gaming props on display in our last game—starting with the huge wooden table–and a sheet of plastic from home depot-covers the cut outs (map) from Fat Dragon Games.The drum-who the bard insists on playing “to raise the morale” of the group was found at a second hand store. The spiders/scorpions and were found at a party store. And the round thing representing a tower was quickly made from card stock and paper rolls with some flooring glued to it–worked in a pinch….enjoy. This entry was posted in Links and Posts and tagged d@d props, dnd props, dungeon and dragons props, dungeon molds. Bookmark the permalink.